The Apigee Developer Services portal (or simply, the portal) acts as a client for Edge. That means the portal does not function as a stand-alone system. Instead, much of the information used by the portal is actually stored on Edge. When necessary, the portal makes a request to retrieve information from Edge or to send information to Edge. See Communicating between the portal and Edge for more information on how the portal communicates with Edge. By default the connection between the portal and Edge uses Basic Auth. If you enable SAML authentication on Edge, then the portal must be updated to use SAML authentication to connect to Edge. 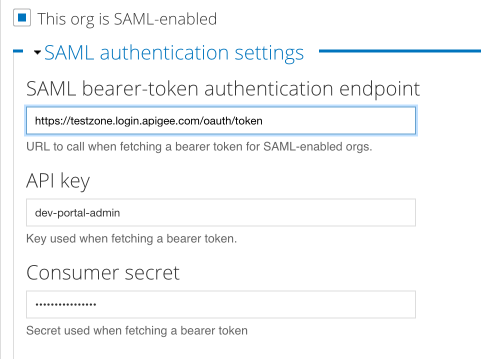 After you enable SAML on the portal, the portal connects to Edge by using SAML authentication. However, portal developers—meaning the developers building apps by using your APIs—continue to log in to the portal using Basic Auth as defined by the portal. Contact Apigee Support to enable SAML as described in Enable SAML for Edge. If you customized any Drupal modules used by the portal, such as the edge-php-sdk and the Apigee Profile Installation module, the process of enabling SAML may take additional time. Inform Apigee Support if you modified any Drupal modules when requesting SAML. Apigee Support will request that you update your portal in Pantheon to install the Drupal modules required to support SAML.